Kevan, Peter G.. "Beekeeping". The Canadian Encyclopedia, 17 December 2016, Historica Canada. https://www.thecanadianencyclopedia.ca/en/article/beekeeping. Accessed 19 April 2019. The complex social organization, the biology and the industrious nature of honeybees (genus Apis) have long fascinated people. When the beekeeper provides a wooden frame, the bees will use it to store honey. 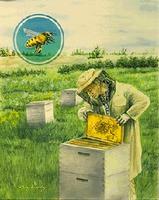 The inset shows the honeybee (artwork by Claire Tremblay). The complex social organization, the biology and the industrious nature of honeybees (genus Apis) have long fascinated people. This may be why many Canadians become hobbyist beekeepers. With only a few hives to manage, they have time to observe more closely the behaviour of these most interesting and social beneficial insects. Beekeeping is not restricted to keeping honeybees. In Central and South America, traditional beekeeping, or maliponiculture, for honey has been practised for thousands of years with so-called "stingless" bees (tribe Meliponini). Now beekeeping includes the keeping of other bees for crop pollination. Beekeeping with honeybees, or apiculture, is the art of keeping bees for honey and beeswax and evolved from honey hunting and gathering. European and African cave paintings indicate that people raided wild honeybees' nests for their sweet bounty at least 15 000 years ago. Egyptian records show that, as early as 3000 BC, bees were provided with domiciles and kept for honey production. Early Greek and Roman writers mention apiculture. The products of the hive were so sought after that the Romans sometimes levied taxes on honey and beeswax. Many references to bees and honey occur in the Bible and the Qur'an. In other religious practices all over the world, bees and honey are featured as having special places in human affairs. Mayan and Aztec traditions revered honey, bees and their relations with flowers. Honeybees have been, and still are in some places, kept in clay pots or cylinders, hollow logs, wicker baskets and straw skeps (hives). However, management for honey production was constrained by these methods. Little changed until the mid-19th century, when the Reverend Lorenzo L. Langstroth, in the US, invented the modern movable-frame hive. The basic principle of this hive is the "bee-space" of about 8 mm. Bees naturally leave a bee-space between their combs. They do not fill this space with comb or block it with bee glue (propilis). Langstroth's insight and invention made it possible to open the hive, examine it and remove honey without destroying the combs. This invention increased honey production and made possible the development of the modern beekeeping industry. Meliponiculture also uses bees in boxes in ways very similar to those used in apiculture, but the nest architecture does not allow for mechanization and the efficiencies of the moveable frame hive. European settlers, colonizing North and South America, Australia and New Zealand, introduced honeybees from their homelands. The bees did well in the new environments; these areas now have important beekeeping industries. In 2000, 9253 Canadian beekeepers kept about 600 000 honeybee colonies with a total honey production of 53 kilograms per hive. Honey is obtained commercially from 4 species of genus Apis. The western honeybee A. mellifera is the most important and widely used. It is native to Europe, Asia Minor and Africa. The Asiatic hive bee A. cerana is the most important Asian species. The giant A. dorsata and dwarf A. florea bees are also Asian species, but they nest in the open and cannot be kept in hives. Wild honey is sometimes harvested from their nests. Stingless bees are sometimes kept in log hives or specially designed nest boxes. They produce honey in smaller amounts than do honeybees. All of these bees form perennial societies, and store honey to help the colony survive periods of dearth, including the winter season in temperate climatic zones. This characteristic makes it possible for the beekeeper to harvest surplus honey. Most other wild bees (eg, bumblebees) feed on nectar but do not store it in great excess and so are not useful for honey production. In midsummer, a strong honeybee (European race of A. mellifera) colony contains one queen, as many as 60 000 to 80 000 workers (undeveloped, sexually sterile females) and some hundreds of drones (males). The queen may lay as many as 2000 eggs daily, mostly fertilized eggs that develop into worker bees in 21 days. Under special circumstances, bees can develop a few of the fertilized eggs into queens in 16 days, by rearing them in large peanut-shaped queen cells and feeding the developing larvae on a glandular secretion, royal jelly. A mated queen can withhold sperm for fertilization when laying; the unfertilized eggs develop into drones. A drone completes development in 24 days. Within honeybee colonies the beeswax comb used for rearing brood and storing honey and pollen is identical and not completely separated as in colonies of stingless bees. Colonies of stingless bees show an amazing array of architectural design, but a general theme is evident. The brood rearing area comprises horizontally arranged tiers of comb. This is kept separated from the honey storage areas that comprise pots, often surprisingly large, that open upwards. Stingless bees use their own beeswax, often mixed with plant resins and other materials, to build their comb and storage pots. Most bees derive their food almost entirely from flowering plants. Nectar is gathered in minute quantities from each blossom and carried back to the hive in the bee's honey stomach. Pollen is transported as pellets in pollen baskets on the bee's legs. Pollen is not used in making honey but serves as a protein source for the developing larvae and for the adult workers. To obtain the large amounts of nectar and pollen required, bees from each colony visit millions of blossoms in a season. While foraging, they act as agents of pollination and provide a vital service to agriculture, a service estimated to be worth 10-20 times the value of the honey and beeswax harvested by the beekeeper. Because their numbers can be controlled and they can be readily transported, honeybee colonies are often rented for pollination and moved to areas where fruit and seed crops are grown commercially. Although honeybees are kept in hives and are often selected and bred for superior honey-producing characteristics, they cannot be considered as fully domesticated as are many animals. They retain their wild instincts and can be managed only within limits. Most Canadian beekeepers keep their honeybees over winter. In winter, bees cluster together and generate enough body heat to keep warm. The beekeeper must ensure the bees have sufficient food and protection from the cold to allow them to thermoregulate. Most honeybee colonies are wintered outside, but some are moved into unheated cellars (particularly in Québec). Beekeepers in the Prairies used to kill their bees in the fall and purchase packaged bees (a queen and about 10 000 workers in a screen cage) from the southern US in the spring. This practice ended with the closure of the border between Canada and the US for the import of honeybees following the spread of mite diseases throughout the US. Prairie beekeepers now keep their bees over winter, sometimes in special overwintering sheds. Major changes in apiculture have come about because of the depredations of lethal parasitic tracheal (Acarapis woodii) and varroa (Varroa destructor) mites. Tracheal mites, native in Europe, invade the trachea, or breathing tubes, of adult honeybees and adversely affect their capacity to breathe and metabolize. Problems become especially severe during the winter when the bees need to breathe hard to thermoregulate within the hive. Varroa mites are ectoparasites native to A. cerana. They infect the brood, damage the developing pupae and ride around on adult bees. Although not devastating to their native host, they are to European races of honeybees. Both species of mites were introduced into the US in the mid-1980s and have caused major problems for the industry there. These 2 pests have since entered Canada but are under constant vigilance. The border remains closed to facilitate that vigilance and to defend against the threat of Africanized honeybees (the so-called killer bees) now established in the southwestern US. Recent research, especially in Ontario, has been directed at successfully producing genetically superior stocks of honeybees that have resistance to or tolerance for mite parasites. Beekeepers who use such stocks of bees, and couple that with integrated pest management strategies using antibiotics, pesticides and sanitary procedures, continue to maintain profitable oeprations. By seeing that the bees have adequate food and space, are kept healthy and have a productive young queen, the beekeeper tries to bring the colony to its maximum population in time for the "honey flow" - the period (usually during June, July and August) when many flowers bloom and bees gather and store excess nectar. The stored nectar is converted into honey through the evaporation of water and by the conversion of the sucrose in the nectar to the simple sugars, dextrose and levulose. Keeping alfalfa leafcutter bees (Megachile rotundata) is an important industry in the Prairie provinces. These bees nest solitarily in tunnels. Under beekeeping management, the nesting tunnels are made in wood or styrofoam boards. The boards stack so that the U-shaped half-tunnels match up. These boards are assembled, often in the thousands, in special shelters located in alfalfa fields. The bees make cells of precision-cut pieces of leaf in the tunnels. They then provision each cell with pollen and a little nectar, and lay a single egg. The eggs hatch and the larvae consume the pollen loaf. Once the larvae have developed to pupae, the boards are separated and the cells removed for refrigerated storage. The following year, the cells are incubated and placed with vacant nesting boards in shelters. For the greenhouse industry, bumblebees (genus Bombus) are now widely used. The technology was developed in Europe and Canada almost simultaneously, but with different species of bumblebees. Nowadays, thousands of colonies of bumblebees are produced for North American (B. impatiens) and European (B. terrestris) greenhouses, especially for pollinating tomatoes. Each colony, reared in specialized facilities, consists of a queen and numerous workers contained in a cardboard hive. There is space for the bees to produce more brood and workers, store a little honey and pollen and have a reservoir of sugar syrup. These highly portable colonies are easily transported, installed and monitored in greenhouses. Prior to 1900 honey was consumed directly with the comb. Today, honey in combs is produced as a specialty crop, and extracted honey (in liquid or creamed form) commands most of the market. Full combs of honey are taken from the hive, the wax cappings removed, and the combs placed in an extractor, where honey is separated from the cells by centrifugation. Honey that has been heated and strained will remain liquid for several months and is often marketed in this form. Over a period of time, some honeys tend to crystallize, forming granulated honey. Granulation may or may not be desirable. The granulation process can be controlled by adding a small amount of previously granulated honey to liquid honey and storing it at a lower temperature (14°C). This speeds up the crystallization and results in a smooth, creamy honey. Granulated honey can be returned to the liquid state by heating it (not above 60°C) until the crystals are completely melted. The colour and flavour of honey depends on the blossoms from which it is derived. Honey from clover, alfalfa, canola, fireweed and basswood is white; that from sunflower, goldenrod and aster tends to be golden; buckwheat honey is dark. In general, darker honeys tend to be somewhat stronger in flavour, but this does not make them inferior in quality. Most honeys are blends, because the bees visit many different plant species in collecting nectar. Honey quality and grading is an important part of the beekeeping industry. If honey contains too much water (over 18%) it can ferment and spoil. It is not necessary to pasteurize honey, but it is often heated and cooled quickly to speed bottling. Some beekeepers harvest pollen from their hives. Pollen traps placed on hives require foraging bees returning to their hive to enter the hive through barriers that cause the pollen pellets on their hind legs to be dislodged and fall into a tray to be collected by the beekeeper. Pollen can be purchased in health food stores and pharmacies. Beeswax is a complex mixture of long-chain carbohydrates. It has great economic value in the pharmaceutical and cosmetic industries as the base for ointments and creams. It is widely used for candle making. Much of the beeswax harvested by beekeepers returns to hives as "foundation" in the form of beeswax sheets imprinted with the hexagonal pattern of the comb. The bees use foundation as the template to build comb and organize the structure of their living quarters. Honeybee venom is collected with special devices. It is used in medicine for treating people with allergies to bee stings. Bee sting therapy (apitherapy) has gained some publicity for treatment of arthritis and multiple sclerosis. Live bees are also a hive product. Production and sale of queens for replacing the aging queens in colonies is an important part of some specialist beekeeping operations. To start a new colony, packages of bees (1-2 kg) with a mated queen or a nucleus colony (nuc) complete with some frames of comb and a mated queen can be used. Species that divide labour between reproductive and non-reproductive groups (castes), have overlapping generations of adults, and co-operatively care for their young. Among bees, the level of sociality varies considerably, and “eusocial” is reserved for those species exhibiting all three of the above characteristics. The transfer of pollen from the male part of a plant (stamen) to the female part of a plant (pistil), allowing for fertilization and the production of seeds. Dedant & Sons, eds., The Hive and the Honey Bee (1975); Peter G. Kevan, ed., The Asiatic Hive Bee: Apiculture, Biology, and Role in Sustainable Development in Tropical and Subtropical Asia (1995); David W. Roubik, Ecology and Natural History of Tropical Bees (1989). Europe warns of human risk from insecticides: NY TimesAn article about possible health hazards associated with neonicotinoids, a nicotine-derived class of pesticide. From the Ontario Beekeepers’ Association. Canadian beekeepers welcome EU neonicotinoid pesticide banAn article about the impact of various insecticides on bee populations. From The Western Producer.